Like most people who grew up in the ’90s, I watched a lot of anime as a kid. What I remember most vividly was the food the characters ate. I salivated while watching my favourite characters bite into delicious dumplings, sushi, maki rolls and cakes. But as a young vegetarian, I knew I’d never be able to bite into a delicious Japanese savoury pork bun. So I did what any mature seven-year-old would do: I moved on. Recently, I rediscovered my love for anime…oops! But this time, I had more tools at my hands, and I came up with a recipe for one of the most delicious Japanese foods: onigiri! 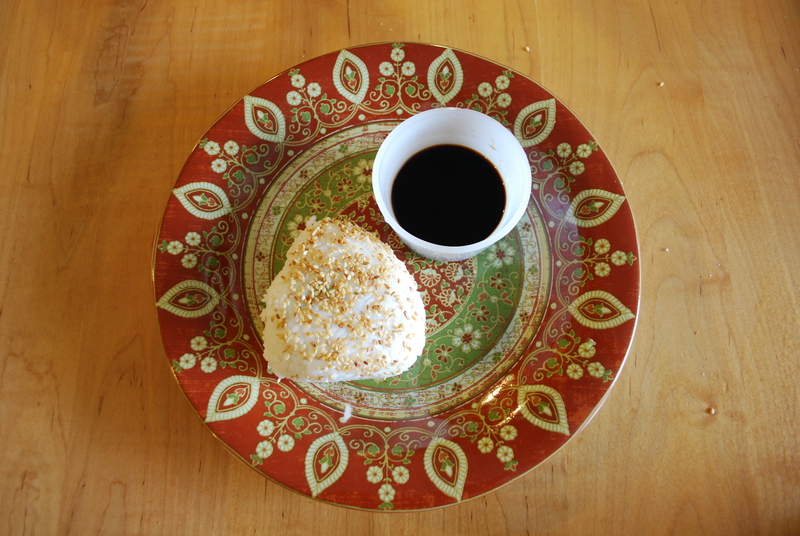 “Onigiri” is the Japanese term for triangular rice balls traditionally wrapped in seaweed. What I love and admire about Japanese food is that most dishes are fresh and healthy. Minimal ingredients are used without using many spices or herbs, which allows each ingredient to shine. Steam rice. I used this helpful guide for the perfect sushi rice. Do not stir rice until fully cooked. Once rice has steamed, pour in rice wine vinegar. 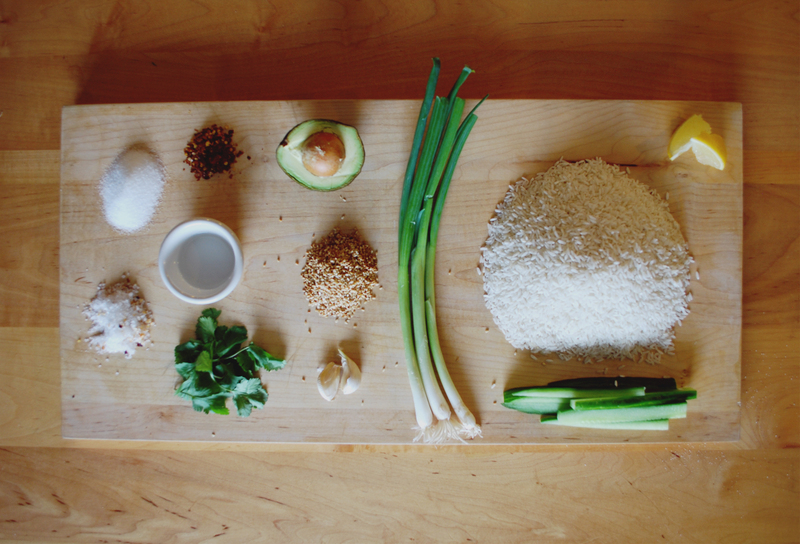 Move rice to a larger bowl and set aside. Let cool. 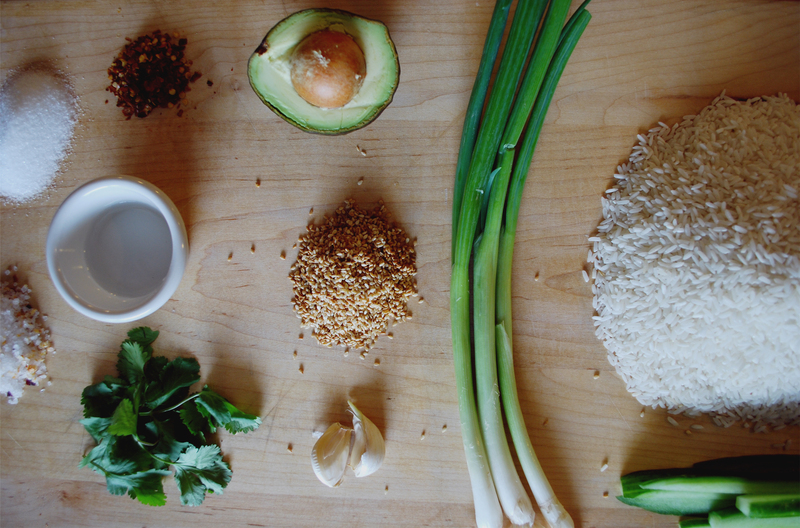 Dice garlic, cilantro and scallions, and cut cucumber and avocado into small chunks. Immediately dress avocado with lemon juice so it does not spoil. *See photographed guide below photo guide below on how to properly cut an avocado. Toast sesame seeds. Place on a baking tray and put in oven at low heat. Let toast about 10 minutes or until seeds become fragrant. Once rice has cooled, begin to assemble the onigiri! Use the photos below as a guide. 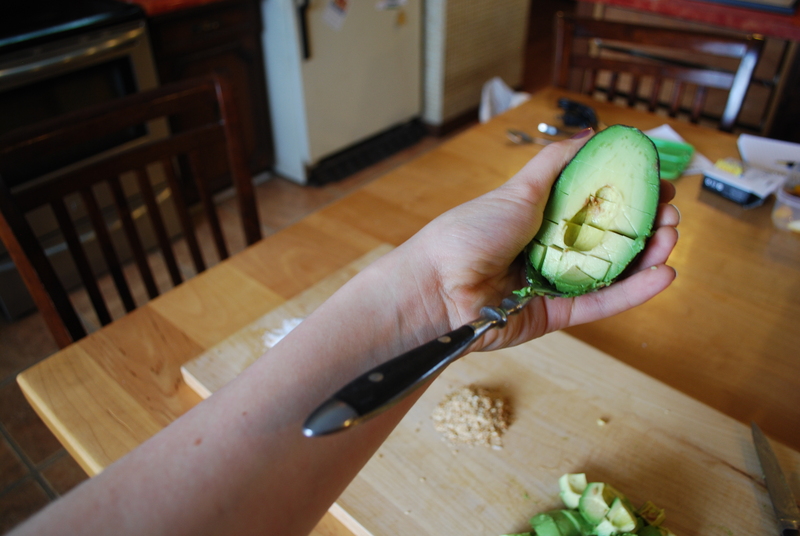 Cut avocado around the seed, split halves and extract seed with knife. Throw seed away. 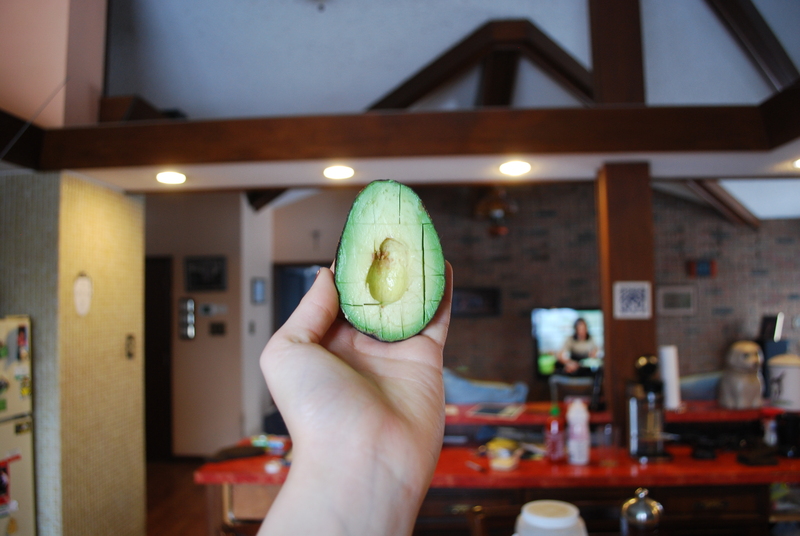 Slice squares into the avocado halves, but be sure not to break through the skin. 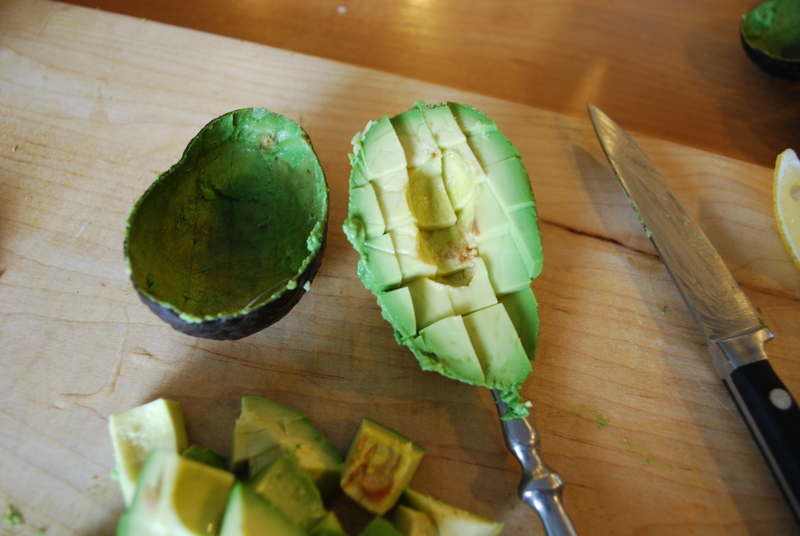 Using a large spoon, slide spoon between the avocado meat and the skin. Scoop! Pop the avocado out of the skin. Boom! 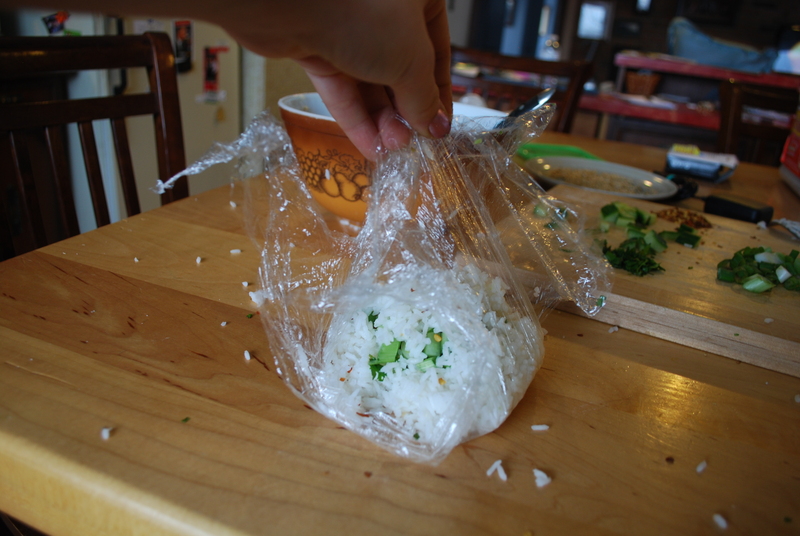 If the rice mixture is not sticky to touch, add a splash more rice vinegar. Spread out a large piece of plastic wrap evenly on cutting board. 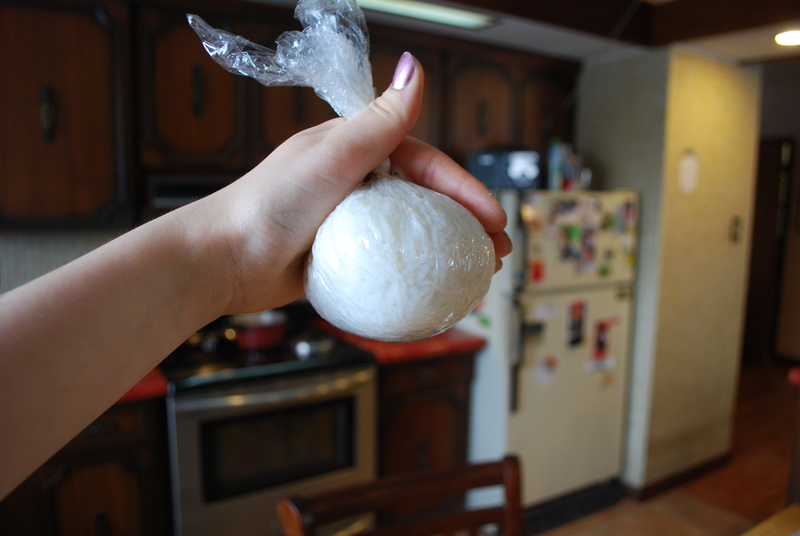 Add a large spoonful to the middle of the plastic wrap. Layer avocado, scallions, garlic, cilantro and red pepper flakes. Add another spoonful of rice on top of vegetables. 7. 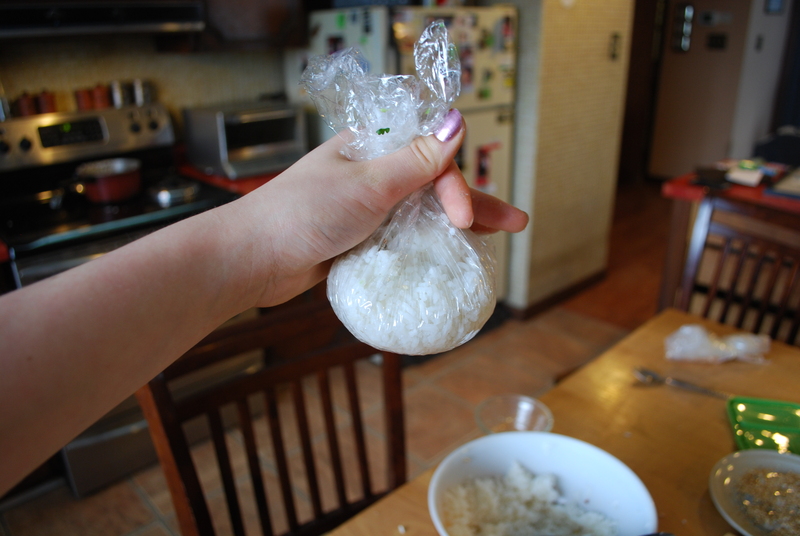 Spin the rice ball until the cling wrap is tight and the rice is closely packed. 8. Shape the ball into a triangle. 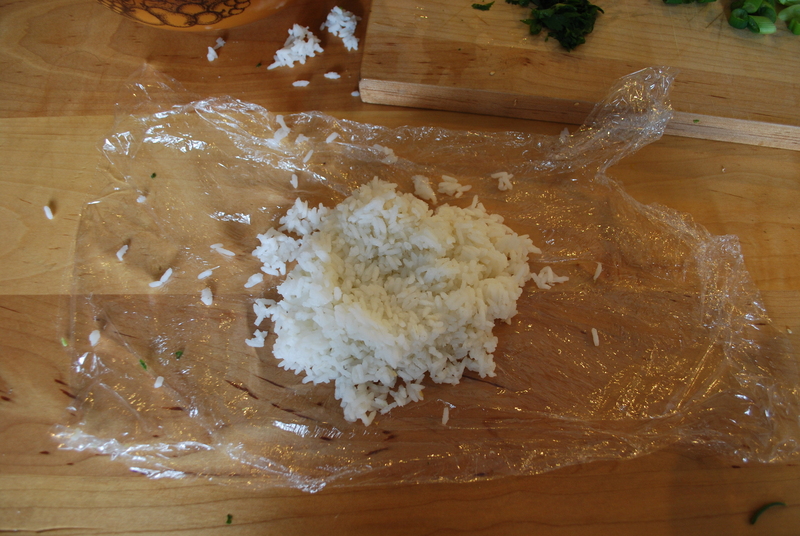 Unwrap from cling wrap carefully and roll in sesame seeds. Ta da! Serve with gluten-free soy sauce if desired. Makes 4 servings.